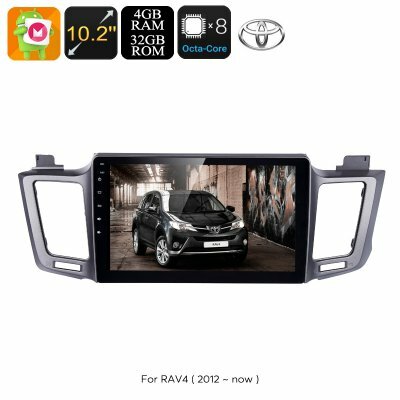 Successfully Added 1 DIN Car Stereo - For Toyota RAV4, 10.2 Inch Display, Android 8.0.1, Bluetooth, WiFi 3G&4G Support, Octa-Core CPU, 4GB RAM, GPS to your Shopping Cart. If you’re the proud owner of a Toyota RAV4 (model 2012 – 2017) and are looking for a way to upgrade your vehicle, this 1 DIN car stereo is perfect for you. With its Android 8.0.1 operating system, this car media player brings tons of entertainment into your Toyota. A large 10.2-Inch HD display allows your passengers to watch movies and play games while you’re driving your car. Your Android media player even supports WiFi and 3G dongle (not included) input. Thanks to this, you’ll be able to browse the web in your car no matter where you’re at. With its Octa-Core processor and 4GB RAM, this car accessory is guaranteed to handle all the basic Android applications. From now on, your passengers will never have to feel bored again while waiting to reach the upcoming destination. Your 1 DIN car stereo naturally supports all regular FM and AM frequencies thanks to which you can enjoy all your favorite talk shows and latest songs while cruising down the streets. Additionally, it allows you to insert MP3 and MP4 files via its USB input and SD card slot. If this is still not enough, you can always synchronize it with your smartphone or tablet PC through Bluetooth. Thanks to its built-in microphone, you’ll even be able to make hands-free phone calls while you’re in your car. With 32GB of internal storage and both USB and TF-Card support, this one DIN car media player holds plenty of memory for you to store all your music, games and more. Besides the abundance of entertainment options, this Android media player also features a GPS navigation system. This car navigator supports 20 channels thanks to which it’s capable of providing you with highly-accurate location data no matter where you’re at. From now on, you’ll be able to head out on your upcoming holidays with confidence. With this car navigation system at your side, you can be guaranteed that you’ll never get lost again. Your one DIN car stereo features a simple design and is easy to install. This makes the car gadget perfect for anybody out there that wishes to upgrade their wheels and entertain their passengers. This car stereo comes with a 12 months warranty, brought to you by the leader in electronic devices as well as wholesale electronic gadgets..
Arabic: - استريو السيارة - Chinese Simplified: - 汽车音响 - Czech: - Autorádia - Danish: - Bil stereoanlæg - Dutch: - Autoradio - French: - Autoradio - German: - Auto-Stereoanlage - Hebrew: - סטריאו לרכב - Hindi: - कार स्टीरियो - Italian: - Stereotipia dell'automobile - Japanese: - 車のステレオ - Korean: - 자동차 스테레오 - Malay: - Stereo Kereta - Norwegian Bokmål: - Bilstereo - Romanian: - Masina Stereo - Russian: - Стерео - Spanish: - Estéreo de automóvil - Thai: - เครื่องเสียงรถยนต์ - Turkish: - Araç müzik seti - Vietnamese: - Âm thanh nổi xe hơi.